Little Mac lunging forward with a fully charged Straight Lunge. Straight Lunge (気合いストレート, Vigorous/Kiai Straight) is Little Mac's neutral special move in Super Smash Bros. 4 and Super Smash Bros. Ultimate. Working as a chargeable move that cannot be stored, Straight Lunge involves Little Mac stepping back to charge up a powerful, forward-sliding straight punch. It differs from other chargeable moves (apart from Ultimate Uppercut) due to its unique property of not gaining damage unless fully charged; the level of charge only increases the distance Little Mac lunges, while damage remains the same. During the entire charging period (and during a fully charged punch), Mac gains slight knockback resistance which can shrug off attacks that deal 8% damage or less. The charging process can only be canceled by letting the move fully charge or by pressing the special button again; however, Mac cannot unleash the attack until around a second has passed. All variations of the move hit the hardest in the first few frames, although the charged version loses comparatively less power than an uncharged lunge. An uncharged, blue-tinted straight that shoots Little Mac forward, giving more distance the more he's charged up. Regardless of charge, this version deals 14% up close, 12% after the initial animation, and 9% during its ending frames. Up close, it boasts surprisingly high knockback for an uncharged attack, with KO potential as low as 100%. Has some ending lag, making it punishable if Mac ends up close to his opponent. Overall, this move is useful as a method for Little Mac to stand his ground, as he will not be knocked back by weak projectiles such as Mega Man's Metal Blade or jab infinites from characters like Fox. It can also be used as a niche way to punish enemies who are prone to spamming edge attacks. The aerial version is impractical due to its harshly reduced damage and distance, unable to KO until 205% and granting almost no distance even if charged halfway. Courtesy of its high ending lag and Mac's ineffective recovery moves, jumping from the stage and using it would also result in an inevitable self-destruct. A fully charged, red-tinted punch that set Little Mac's fist on flames, sending him almost half the distance of Final Destination. This version takes about three seconds to charge and gains significant ending lag, as Little Mac will flex his burning fist. However, it deals 25% damage and boasts extreme knockback, having KO potential on the majority of the cast at as low as 60% even from the middle of medium-sized stages. While strongest during its first few frames, a late hit still deals potent knockback, and the initial hitbox deals enough shield damage to break any damaged shield. However, its charge time makes it almost impossible to land during 1v1 matches, leaving it only useful against enemies that have a broken shield. It is recommended to space slightly away from the opponent if attempting so, due to this variant's infamous point-blank blind spot. Like the uncharged variant, this move deals significantly lower damage and knockback in the air, although Little Mac's low jump height and high falling speed means it cannot be fully charged in the air under regular circumstances. However, a fully-charged lunge shoots Little Mac forward without falling, which can be useful for gaining horizontal distance if he is sent flying way offstage in an upward direction. Despite this, the charged move is ineffective for recovering, as the move still ends with considerable lag and Little Mac begins falling the moment the move's initial "lunging forward" animation finishes. He also can't grab ledges until his fist stops burning. In stark contrast to its power in standard matches, a fully charged Straight Lunge has low knockback scaling, making it inferior as a finisher in Home-Run Contest when compared to the Home Run Bat since it doesn't send the Sandbag considerably further when it is at high percentages. Like most of Little Mac's special moves, Straight Lunge has a unique 8-bit sound if he is using a Wireframe alternate costume. If Kirby copies him while in that costume, he uses the 8-bit sound along with his own voice. Unlike most special moves when done as quickly as possible after jumping from the ground, Little Mac remains grounded when performing Straight Lunge this way. This makes it especially useful when repositioning him to properly land the attack. Little Mac using the KO Uppercut. When Little Mac's Power Meter is full, his Straight Lunge is replaced with a single-use uppercut named the KO Uppercut. While it has the word "KO" in its name, it is not a true one-hit KO. Regardless, it is one of the strongest standard special moves in the game, surpassed only by Ganondorf's Reverse Warlock Punch, a fully charged Flare Blade, and a Judge 9. Getting a KO Uppercut requires Little Mac to either receive 100% damage or deal 333% damage to opponents (or, more likely, a combination of both) to fill up his Power Meter via his own attacks or melee-based items; thrown items do not contribute to the meter. Unlike other special moves, Little Mac can only safely hold a KO Uppercut for four seconds before it is vulnerable to being removed by any attack that causes Little Mac to tumble. The attack itself can be considered similar to a fully-charged Wario Waft: it is immensely powerful yet extremely fast, hitting on frame 9 and dealing enough knockback to KO the entire cast at 35% (with the exception of Shulk in the Shield Monado Art). This is dependent on the opponent's weight due to the uppercut's strong vertical angle (Jigglypuff in particular only needing 12% to be at KO percentage). However, Little Mac's KO Uppercut suffers from high ending lag, making it very risky to attempt in a predictable manner should the attack miss. Fortunately, the move's quick startup and Little Mac's excellent grounded combo potential allows a KO Uppercut to true combo from many of Mac's moves, which will be explained in further detail below. It is completely unblockable and ignores armor, making Witch Time the only defense it does not bypass. Little Mac gains super armor from frames 8-9. Like with Straight Lunge, the KO Uppercut will work as if it was grounded if done correctly right after jumping from the ground. The uppercut creates a small windbox when unleashed. In rare cases, this can force an opponent offstage unexpectedly should they dodge the initial hitbox, and can also cause the attack to miss entirely. The windbox can even be negated by a counterattack's counter frames, making it seem like it was "countered" with no effect to the opponent. If the attack lands, it gives tremendously high freeze frames to Little Mac and his victim; this applies to items like the Sandbag or Fire Hydrant. This can catch opponents even if they walk towards Little Mac while he is stuck in the move's freeze frames, without any loss of power (an example shown here, where it is abused to KO Pac-Man on a tower of crates). If 2 KO Uppercuts are used at the same time, port priority is used to determine who delivers the attack. Consistent with Little Mac's depiction as a very strong fighter on the ground and very weak in the air, the aerial version of KO Uppercut is drastically weaker, with no KO potential until 151%, and also becomes blockable. However, using the KO Uppercut while having any sort of forward momentum gives Little Mac some decent horizontal distance, which can help him get back onstage. This tactic can boost Little Mac's abysmal recovery on certain stages, notably ones with walls that allow him to wall jump, although it is a very risky tactic in general, since the move's high ending lag makes it extremely likely that he'll be KO'd anyway. In Super Smash Bros. Ultimate, Little Mac will jump slightly when using the KO Uppercut before instantly returning to the ground, as opposed to the previous game where he remained grounded. This makes it more closely resemble the Star Punch from the NES Punch-Out!!. Alongside its faster speed, it is now easier to land and has a larger hitbox due to Mac's movement. The aerial version now grants good horizontal distance and can be used for an actual recovery due to its ending lag being reduced, but it is no longer unblockable. Kirby can use the Straight Lunge via copying Little Mac, but does not gain a Power Meter and thus can only use the standard version of the move. Due to the KO Uppercut's sheer ability to turn a game around, the move can be easily telegraphed despite its quick startup. However, Little Mac grounded combo prowess grants him a few combos he can use to give himself a better guarantee to land an Uppercut, giving him potentially one of the most potent combos-to-KOs in the game along with more mixups to play mindgames with the opponent. Little Mac's first and second hits of his jab can be jab cancelled into a KO Uppercut. It is the easiest way to land a KO Uppercut (especially if the opponent shields the jabs, as the Uppercut bypasses shields). Success isn't guaranteed on lighter fighters, however, as a quick player will be able to act out of hitstun right before Little Mac unleashes the Uppercut, allowing them to simply jump away. 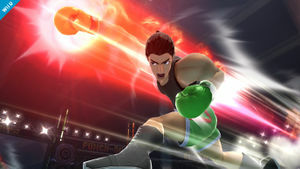 Depending on the opponent's percentage, weight and falling speed, Little Mac's down tilt can position his opponent for a KO Uppercut, especially if they are conditioned to airdodge during the game (which will make them suffer from landing lag and guarantee success). It is the most reliable way to combo the Uppercut against fastfallers such as Fox and heavier fighters like Bowser, but middleweights and light characters such as Jigglypuff will be sent too high for the Uppercut to hit once they pass a certain percentage. If an opponent bounces off the ground, Little Mac can use his incredibly fast down aerial to jab lock an opponent into getting up, then unleash a KO Uppercut. This can work as a combo starter for any of Little Mac's other moves, but the jab reset itself requires pinpoint timing as Little Mac's down aerial has an incredibly small hitbox. Combining the previously mentioned setups allows Little Mac to deal a potential zero-to-death combo, particularly on fastfallers and heavyweights; starting with several down tilts, a Jolt Haymaker can then force an opponent forward onto the ground, followed by a down aerial which will lock the victim if they miss the tech. Little Mac can then end it with a KO Uppercut, or a few more down tilts to rack up more damage. A ledge-canceled KO Uppercut, dubbed the Gazelle Punch by players, allows Little Mac to instantly release an uppercut against any opponent near a ledge. It simply requires the player to use a ledge jump get-up and then a KO Uppercut almost immediately, although it is extremely frame strict due to the window being only 2 frames long. A situational technique relies on Smash 4's jab mechanics, allowing Little Mac to end his jab infinite with a KO Uppercut. As multi-hitting jabs slowly push the user away after a few seconds, Little Mac can face himself away from the ledge, then trap an opponent at the side of the stage with a jab infinite. Once Little Mac is is pushed offstage, he can instantly cancel his jab into the KO Uppercut for a true combo. This technique has to be used at low percentages, as extremely damaged opponents can get knocked out of the jab. The timing for this makes it incredibly risky, as inputting either too early or too late will make Little Mac end his jab with a finisher, swing the Uppercut too late, or send him offstage while trapped in the Uppercut's high ending lag, causing an SD. Additionally, the player has to have the KO Uppercut ready while both Little Mac and his opponent have to be extremely close to the ledge to even attempt the move, making this technique highly situational. "Blast forward with a powerful punch. Press once to charge and again to strike." "Blast forward with a flaming punch that hits multiple times before launching opponents." "Blast through opponents at high speed. Will stun and launch at full charge." Flaming Straight Lunge: Adds a Flame effect, hits multiple times, and has a much faster charge time of about one second, allowing it to be used as a horizontal recovery albeit with high endlag, along with extreme risk as Little Mac cannot sweetspot the ledge until the move is complete. It travels a shorter distance and deals less damage, and its multiple hits do not chain well against opponents at high percentages, making it possible for them to DI out after the first few hits. Stunning Straight Lunge: Adds an electric effect and at full charge will paralyze enemies before launching them. The lunge is also faster and covers a much greater distance, sending Little Mac the entirety of Final Destination's length at full charge. However, it deals less damage and lacks knockback resistance. If partly charged, this move shoots Little Mac forward with decent horizontal distance, which can be used in the same way as a fully charged Flaming Straight Lunge to get back to the stage, albeit without high ending lag, making it a better recovery move overall. *All custom variants of Straight Lunge do not alter KO Uppercut in any way. 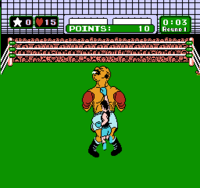 Little Mac performs a Star Uppercut in Punch-Out!! The uppercut is a reference to Little Mac's signature move in the Punch-Out!! series, the Star Uppercut. This move deals considerable damage and has a higher chance of leaving Mac's opponents down for the full ten-count. The power meter originates from the 1984 arcade Punch-Out!! If Little Mac keeps attacking the opponent, the power meter will fill, but taking damage will cause the meter to fall, unlike in Smash Bros. When the power meter is fully charged (indicated by a glowing "KO" similar to the meter in Super Smash Bros.), the player can perform one of two knockout punches, an uppercut or a body-blow, by pressing a button on the arcade cabinet depending on the position of the gloves. The only Punch-Out!! game to retain this system outside of the arcades was Super Punch-Out!! on SNES. Straight Lunge as shown by a Skill Preview in Ultimate. Little Mac has a specific animation when he uses a fully charged Straight Lunge in the air: spinning around and doing an awkward flex. Due to Little Mac's attributes (specifically his poor jumps and fast falling speed), this animation is difficult to spot, as he has to be either close to the top blast line or using customs to finish charging up a Straight Lunge in midair. Although Little Mac's fist gets engulfed in flames when fully charged, a fully charged Straight Lunge does not do Flame damage. Straight Lunge is one of the only chargeable moves that does not increase damage or knockback with charging until fully charged; charging and releasing Straight Lunge before then only has increasing traveled distance. The other is Ultimate Uppercut, which, like Straight Lunge, does not possess increased damage or knockback unless fully charged. A successful hit with the KO uppercut will cause the game to go in slow motion, as the camera zooms in on Little Mac for about a second. It is possible, however, that the camera won't focus on Mac, though the game still slows down. This seems to happen if Little Mac is hit out of the Uppercut animation after it lands or if the camera is in a locked distance, such as during the 3DS subgame Smash Run. Little Mac's Power Meter gain is directly affected by equipment, as they can change the damage he takes and deals. Grabbing Little Mac while he's performing KO Uppercut will not only stop the move, but also cause the grabber and Little Mac to slide back a large distance, as seen here. Rarely, a KO Uppercut will still connect during its ending frames, as seen here hitting Diddy Kong. It only happens if Little Mac lands during the last active frame of the hitbox. There is an unused animation showing Giga Mac using the KO Uppercut suggesting either that there was a point in time where he could use it, or that it was a leftover from Little Mac's default moveset. If Kirby copies a wireframe Mac, he uses the 8-bit sound along with his own voice. This page was last edited on March 10, 2019, at 22:36.